Had the luxury of doing exactly what I wanted to do this morning. I spent the entire morning puttering around the kitchen. Made lentil soup and created a vegetable soup with the leftovers from the ongoing spiralizing project. When spiralizing parsnips, you can only use the thick ends, so the skinny leftovers ended up in the soup pot. Same for the globed end of a butternut squash, the thin parts of the carrots, etc. I also had some kale and corn in the frig, so that got tossed in as well. Love soup like that! This Spiralizer is providing a fair amount of entertainment, in addition to making sure that we get more than our daily quotient of veggies. Today, I spiralized butternut squash, parsnips, carrots, onions and zucchini. I added thinly sliced red peppers to the mix. Tossed the combined veggies in a little olive oil, salt and pepper and spread them out on a half sheet pan. I roasted them at 400 degrees for about a half hour, mixing them around about half way through. That left me with more than enough filling for the vegetable crostata that I plan to make for dinner tonight. Not willing to stop there, I decided to make veggie stuffed mushrooms. I cleaned and de-stemmed a few mushrooms and sautéed them very briefly in a little butter. 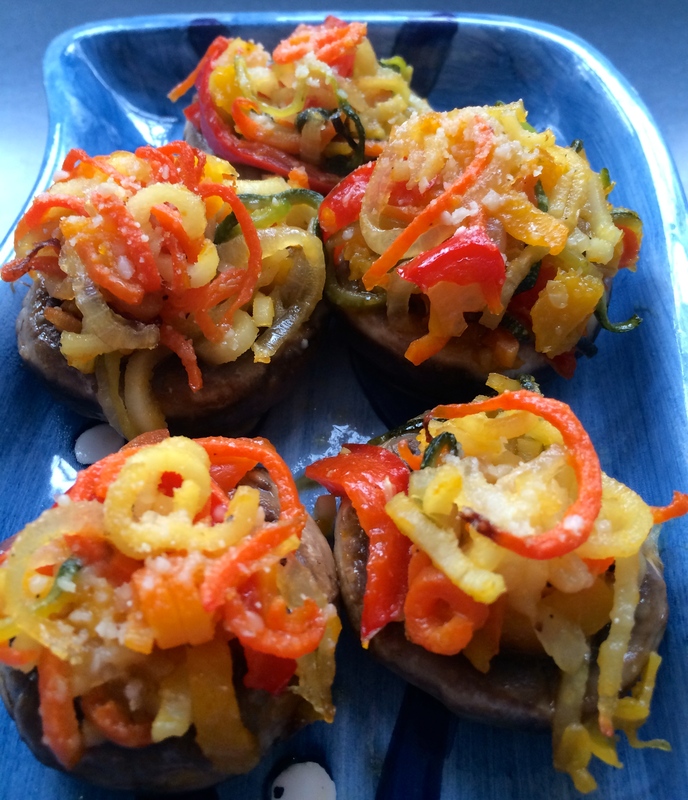 I put a tiny bit of pesto in each mushroom “cup” and filled them with the roasted veggies. Sprinkled a bit of Parmesan on the tops and put them in a 400 degree oven for about 15 minutes. A new all veggie appetizer has been born! Looking forward to tonight’s crostata. Thinking about a stir fry with chicken tomorrow. Having fun with this thing! 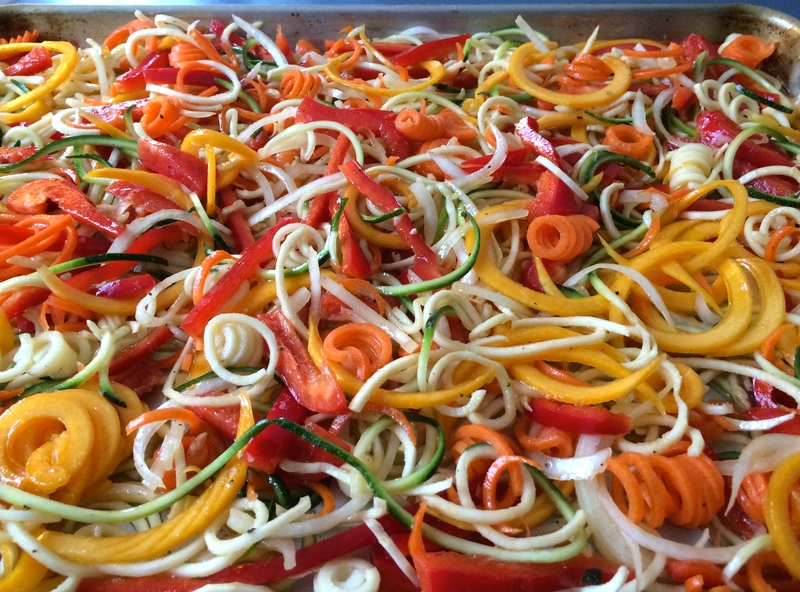 This entry was posted in Spiralized and tagged roasted veggies, vegetable soup. Bookmark the permalink. These recipes all sound so good…and healthy! I think that you have inspired me to put a spiralizer on my kitchen gadgets “must have” list! I think we need a taste testing!